: The U.S. Army is seriously looking into adopting a new caliber bullet for its infantry weapons. Now is the time to do it, as a new infantry rifle, the XM-8, is moving quickly through field testing. The proposed new caliber is 6.8mm (also known as .270). Officially, it's the 6.8mm Remington SPC (Special Purpose Cartridge) Special Forces troops were the first to use 6.8mm ammo in combat, and they were impressed with it's better (than 5.56mm bullets) ability to take down enemy troops. This should be no surprise, as the 6.8mm round is based on the 19th century 30-30 round. The 6.8mm round is a modified 30-30 caliber round based on the Remington 30 cartridge (first introduced in 1906). The 30-30 is a rimless round first designed for lever action rifles. Most of those lever action rifles you see in cowboy movies are 30-30s. The 30-30 round is still popular with deer hunters because of its ability to bring down deer (of up to about 400 pounds) or wild pigs (up to 300 pounds) at common hunting ranges (100-150 meters) without producing a lot of recoil, or requiring a heavy rifle. The 6.8mm round has a bullet that's about 40 percent lighter than 30-30 rounds, but about twice as heavy as the current 5.56mm bullet. The superior hitting power can be seen in comparing muzzle energy (1158 foot pounds for the 5.56mm bullet versus 1793 for the 6.8mm round.) At 500 meters it's 338 versus 600 foot pounds. This means that, out to about 600 meters, the 6.8mm round has about the same impact as the heavier 7.62mm round used in sniper rifles and medium machine-guns. The 30-30 was never seriously considered for military use, because when standards for modern military rifles were established a century ago, there was an emphasis on killing power and accuracy at long ranges (500-1000+ meters.) The 30-30 was meant for short range shooting, not more than 200-300 meters. But what no one really noticed over the next century was that most infantrymen used their rifles on targets 100-200 meters away. Actually, during the 1930s, the Germans studied their World War I experience and concluded a less powerful and lighter rifle round would be more effective. They were working on a smaller 7mm round, but settled on a shortened regular rifle round (7.92mm), because war was looming. During that war, the Germans developed the first modern assault rifle, the SG-44. This weapon looked a lot like the AK-47, and that was no accident. The SG-44, like the AK-47, used a shortened, 7.92mm, rifle cartridge. This gave the infantryman an automatic weapon that could still fire fairly accurate shots at targets 100-200 meters away. The SG-44, and the AK-47, had about the same stopping power as the 30-30. What a coincidence. The AK-47 didn't have the accuracy of higher powered bullets, but the Russians didn't see this as a problem, because most troops using it had little marksmanship training. If they had to kill someone, they could fire at full auto. The U.S. M-16, and its high speed 5.56mm round, was more accurate than the AK-47 when firing individual shots at shorter ranges. But the wounding power of the 5.56mm (.22 caliber) bullet fell off rapidly at ranges over a hundred meters. The U.S. Army has, since the 1980s, developed an army of marksmen, at least in the infantry. Even journalists noticed this in Afghanistan, where at night they could tell where the American troops were. The American infantry fired single shots, while the Afghans fired bursts of automatic fire. American soldiers get a lot more out of their weapons with well placed single shots. Better sights (a variety of electronic and laser aided devices), plus lots of marksmanship training, have produced infantry units that are a lot more lethal, and a lot less likely to run out of ammo. This is not a unique development. Before World War I, the British army, an all volunteer force, trained hard to develop good shooting skills. British riflemen could deliver a dozen well aimed shots a minute, and keep doing it for minutes on end. German troops who came up against this thought the British had a lot of machine-guns (which the Brits did not) because of the number of German troops who were going down with bullet wounds. The British were using the .303 caliber rifle (similar to the 7.62mm by American snipers today) and were taking down German troops at ranges in excess of 500 meters. U.S. troops today can do the same thing, if they have a weapon with the accuracy and hitting power to support that kind of shooting. The 6.8mm round, having a higher velocity than the 30-30, but also a heavier bullet than the M-16, provides the combination of long range accuracy and hitting power that American troops of today can take advantage of. In Afghanistan and Iraq, there were many situations where U.S. troops were able to spot enemy fighters at longer ranges (over 500 meters), but were not able to do much damage with their 5.56mm rifles. But Special Forces troops using M-16s modified to handle the new 6.8mm ammo, got much better results at these long ranges. American troops in support units are not as accurate when using their rifles, but the new electronic sights help, and the new XM-8 rifles will still allow automatic fire, which always helps in an emergency. The low recoil of the 6.8mm round makes it easier to fire on full automatic. This was a big selling point with the 5.56mm round and the M-16. The older M-14, firing full power 7.62 rounds, had too much recoil for accurate automatic fire. The 6.8mm ammunition is heavier, meaning about 20 percent fewer rounds are carried (unless you want to carry more weight, which no grunt wants to do). But with troops capable to accurate single round shooting, you don't need lots of ammo just to survive. 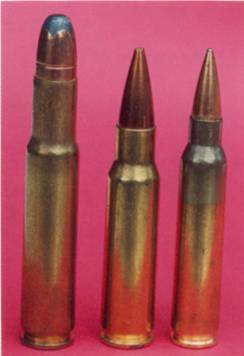 Click here for a picture of the 30 Remington (a rimless 30-30), 6.8mm Remington SPC and 5.56mm rounds together.